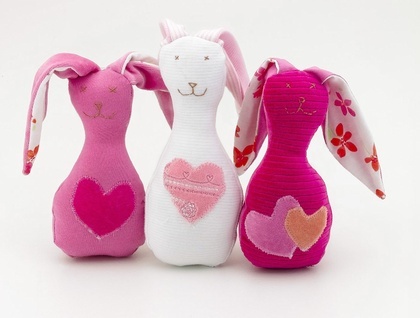 Snuggle Bunnies are a squishable soft snuggly baby rattle made to my own design. 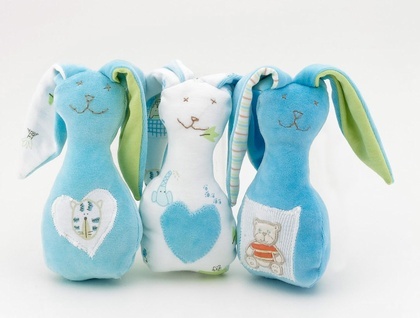 You can snuggle your bunny or use it as a soft rattle. 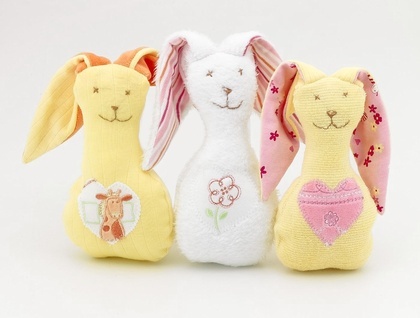 Each bunny is lovingly made from soft tactile fabrics, embroidery applique heart on front tummy, soft ribbon tail on back. I use fabrics such as soft velour or satin for the inside of the ears to make cuddling your bunny even more special. I hand embroider each bunny face so they are baby safe. Pinky is made from soft pink knit fabrics, her ears are a soft knit rib with striped fabric on the inside. She is a one of a kind bunny with a soft velour heart. I have an assortment of different colours available, feel free to message me if you have a special colour request. Made in a smoke free environment with love.